Palos Verde Estates - This is an entertainer’s dream home you don’t want to miss! MLS#3482733. Keller Williams Lake Norman. Community amenities include clubhouse, Jr. Olympic pool, tennis/basketball court, boat storage, street lights, walking trails, playgrounds, pavilion, and lake access. MLS#3498942. 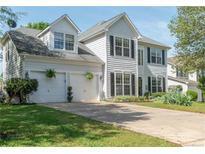 Lake Norman Realty, Inc..
Chesapeake Pointe - Great Brawley School Location off Isle of Pines. MLS#3498985. EXP REALTY LLC. Stonemarker - Tons of Room and Ready for some TLC...this home has HUGE potential with very nice high end homes surrounding. MLS#3499104. WEICHERT, REALTORS- LKN Partners. "New phase in community" GPS address: 268 Kistler Farm Rd., Mooresville, NC 28115 MLS#3499731. Niblock Development Corp.
Ashlyn Creek - Your dining room is conveniently located at the front of the home. MLS#3499741. Niblock Development Corp.
Main channel and island water views from this home in a protected cove and on a point lot; 319 feet of riprapped water frontage; Pier with a dock house with electric, speakers and a mini refrig; 7,000 pound boat lift at the floating dock; Steps from the dock lead into the water; Water at the slip is approx 25 ft deep; Enjoy main channel and cove views while relaxing on the open deck or under the protected patio; Dead end road in a private neighborhood with large homes and new construction nearby; Covered front porch entry; Remodeled kitchen with granite counters, tile backsplash, farm sink, stainless appliances, recessed lights; Dining Room and Great Room vaulted ceiling with magnificent water views; Grt Room gas logs fireplace; Laminate wood floors on 1st floor; 1st floor den could be a great office; Finished basement with newer ceramic tile floors, 2 sets of sliding glass doors to the patio; Bathrooms redone with tiled floors, tiled tub/shower stall, toilets, sinks, vanities; Septic tank new in 2014 MLS#3497767. Keller Williams Mooresville. Community is friendly, small and quiet. MLS#3499108. Sellstate Select. Curtis Pond - Come make this one your next home! MLS#3489582. Lake Norman Realty, Inc.. This is truly a home that will fit your lifestyle! MLS#3497925. Keller Williams Mooresville. This is a Dandy of a home, ready for new owner to cherish. MLS#3496570. Knight Properties. Don't miss this amazing detached garage/workshop! ! MLS#3497992. Allen Tate Mooresville/Lake Norman.